I would prefer to see Billy Joel's version of The Trooper. Trying to manifest this in my limited imagination is the closest i have come to Lovecraftian madness. iamaom and The906 like this. This needs to happen, But he has to wear the uniform and wave the flag. XPT707FX and KnightBrolaire like this. i'm sick of the ToAn Is In YoUr HaNds argument. yes, it''s a big part of tone, but so is gear and knowing how to utilize said gear well. As far as I'm concerned it's a 50/50 split between hands/technique and gear. Mathemagician and The906 like this. Black guitars with brownish fingerboards are the red headed step children of guitar color schemes. If I never see another one, it will be too soon. Half the guitars put out by my favorite companies fall into this category. Please stop buying them so that they stop making them. Mathemagician, iamaom, KnightBrolaire and 2 others like this. Roasted maple is fast becoming like rosewood to me. It only works on certain guitars with certain motifs/color schemes. Most of those new jackson juggernauts look chintzy af with brown fretboards imo. Mathemagician and Strobe like this. Kreator needs more love, same with Voivod. Brexit is actually going to be better for the UK than remaining in the EU, especially given that if we now cancel leaving and go back with our tails between our legs, all the pre arranged deals we have been living with from them, get cancelled. So suddenly we are likely to be required to change currency to the Euro, lose any former pre agreed deals, and miss out on a few extra billion. funny how literally no remainer ive seen on my Facebook, has mentioned that. No deal at this stage is actually on paper (short term financially and long term former deal wise) better for us than going back on it now. Ordacleaphobia, FILTHnFEAR and Spaced Out Ace like this. There’s no good outcome from Brexit now. The best deal was the deal we had before Cameron decided to play party politics with the fate of the country and lost. And the ‘majority’ of Britons were too short sighted, too arrogant or just too plain stupid to realise it. AxeHappy, iamaom and lewis like this. Yeah but thats hindsight - im only talking about now and going forward, not the past. Thanks to our awful political system and the dickheads tasked with heading it. Ive pushed for a new era of politics for literally years. Its embarassing at this point. I had a wacky idea earlier. So you know how Ireland/Scotland might break away from the UK and try to get grandfathered into the EU? What if Britain approves a bill that splits into two separate countries (let's call them North and South Britain) a day BEFORE brexit takes place, and then asks for the same deal that Ireland/Scotland gets because they were technically never brexited, it was Britain, the now defunct country that triggered article 50, not North Britain or South Britain (which both recognize Lizzy as their queen). 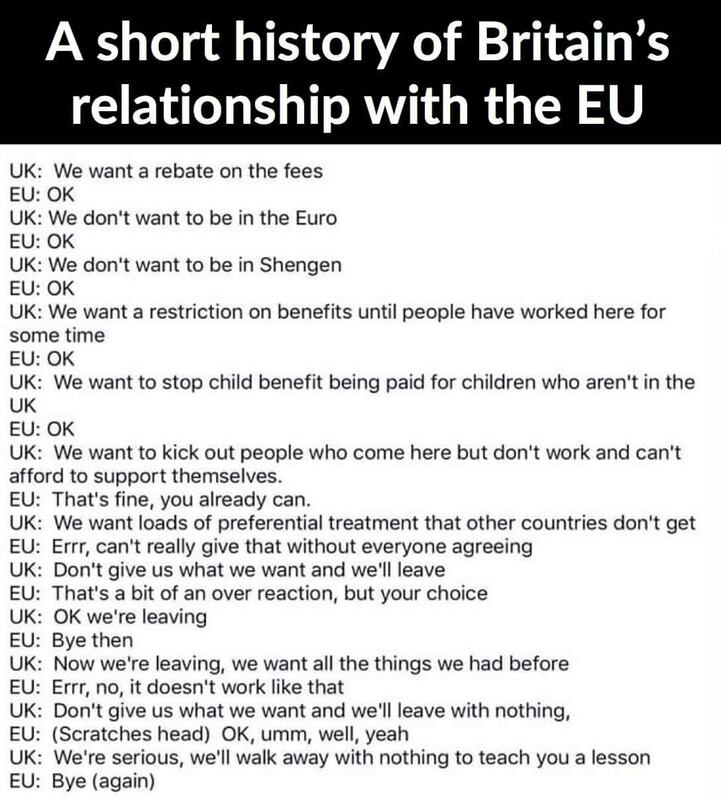 Then when the EU, due to the ingenious loophole, gets admitted to the EU they both agree to form back into Britain. Thus, Britain gets to brexit and remain in the EU at the same time and everyone is happy. I never heard Voivod til last year. I started with Nothingface (which is still my only Voivod album), and when I clicked play I had no idea what to think. The production is crappy, the vocalist immediately reminded me of old Anti-Flag... I was like can I even like this if I wanted to? It's god damned fantastic. I love this CD so much, I haven't even gotten another one because I just keep wanting to listen to Nothingface. Their discography is kinda intimidating. I probably will listen to other albums eventually. But dude Nothingface is too good! Vilk found this ... which unfortunately is actually pretty darn accurate! AxeHappy, XPT707FX and lewis like this. You should check out some of their other albums like Roarrr, Killing Technology and The Wake. All of those are stupidly good. The Wake is much more proggy and weird, but Roarr and Killing Technology are just batshit balls to the wall prog/thrash. Kreator is awesome. They were one of the few 80s thrash bands to actually get better over time, like Testament. Yep, even their latest album is really good and pretty versatile too. I especially like Death Becomes My Light. Quoting a celebrity with a stance that's similar to yours to make your point in a debate is weak. A celebrity, at the end of the day, is a person and their opinions hold no more water than anyone else's. Similarly, quoting a movie or a song to get your point across in a debate is also weak as the entertainment was provided by a person who once again doesn't have a more important nor less important opinion than anyone else's. TedEH, Ordacleaphobia and XPT707FX like this. Also, overplayed music doesn't equal "bad music." XPT707FX and _MonSTeR_ like this.